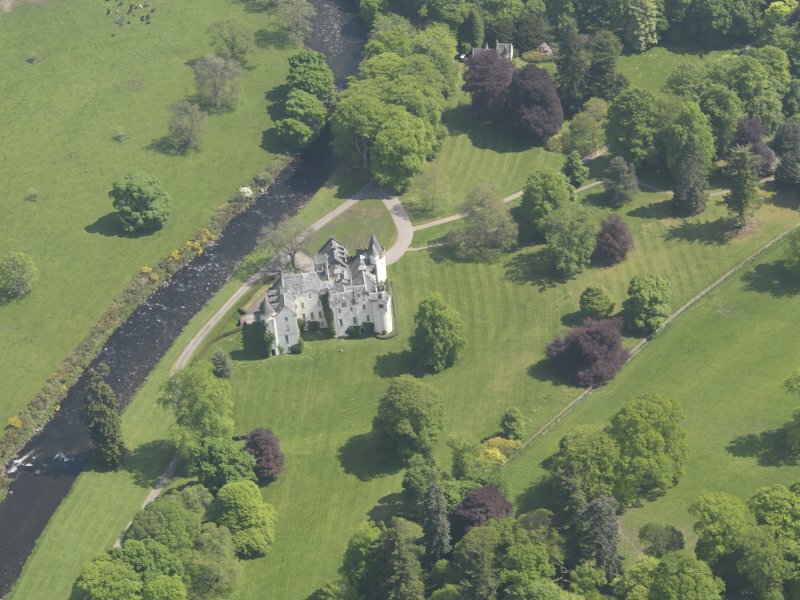 General oblique aerial view of Cortachy Castle Policies centred on Cortachy Castle, taken from the E.
Oblique aerial view of Cortachy Castle, taken from the SSW. 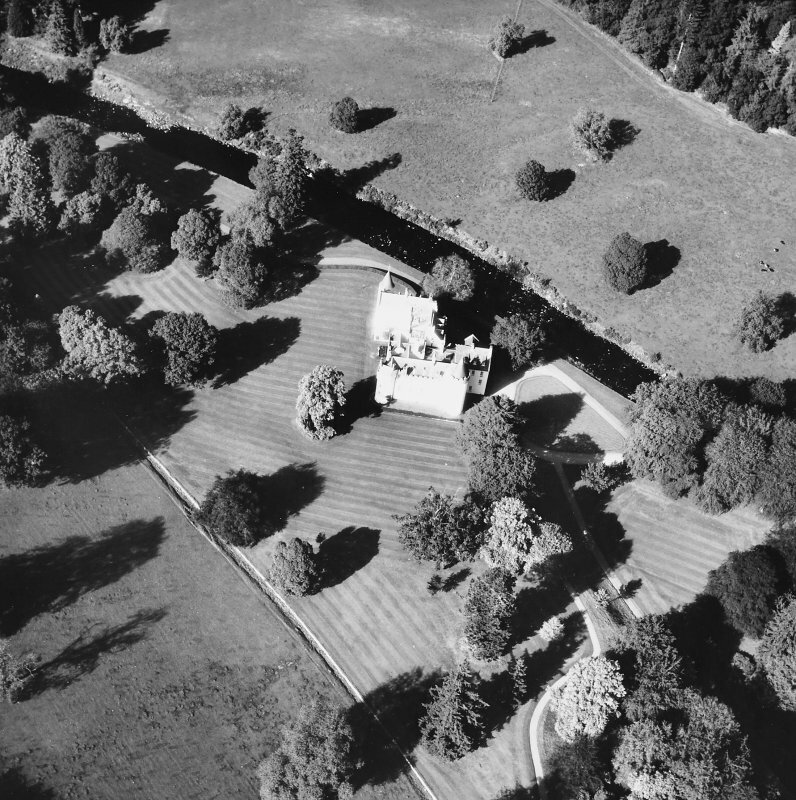 General oblique aerial view of Cortachy Castle Policies centred on Cortachy Castle, taken from the WNW. 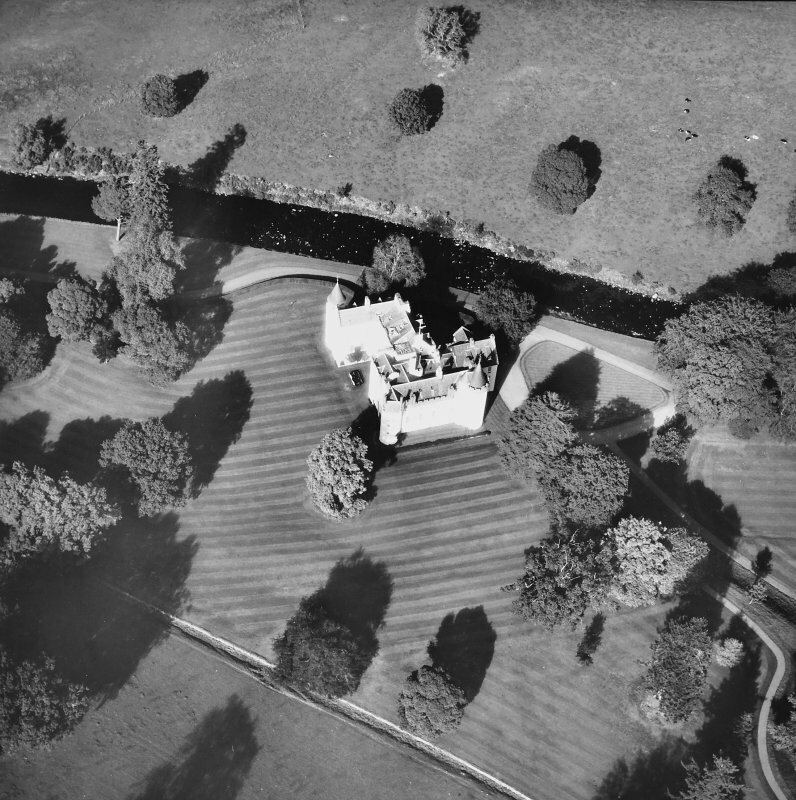 General oblique aerial view of Cortachy Castle Policies centred on Cortachy Castle, taken from the S.
General oblique aerial view of Cortachy Castle Policies centred on Cortachy Castle, taken from the SW.
Oblique aerial view of Cortachy Castle, taken from the W.
Oblique aerial view of Cortachy Castle, taken from the S.
View of Cortachy Castle from W.
General oblique aerial view of Cortachy, looking NNE. 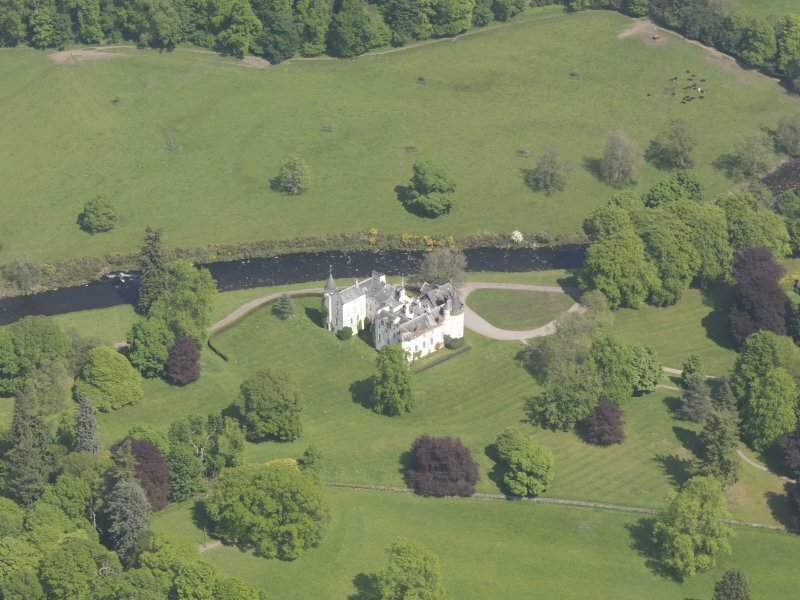 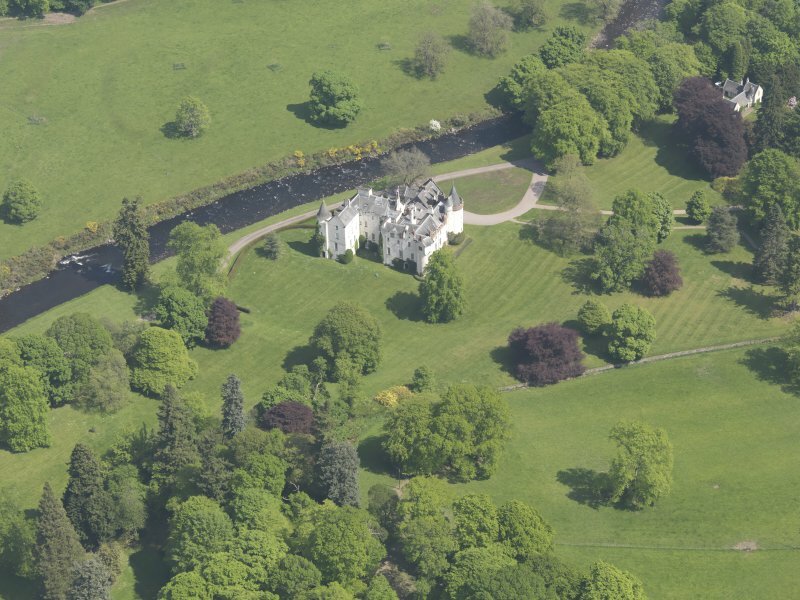 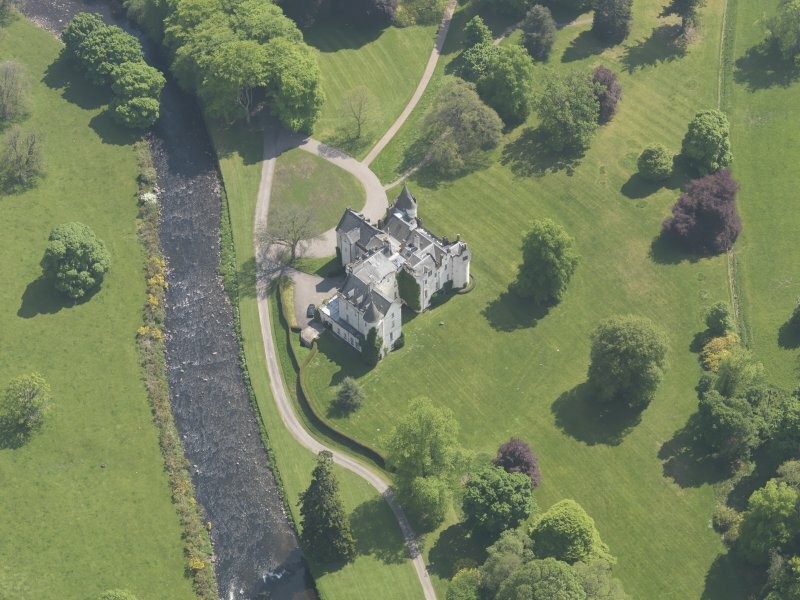 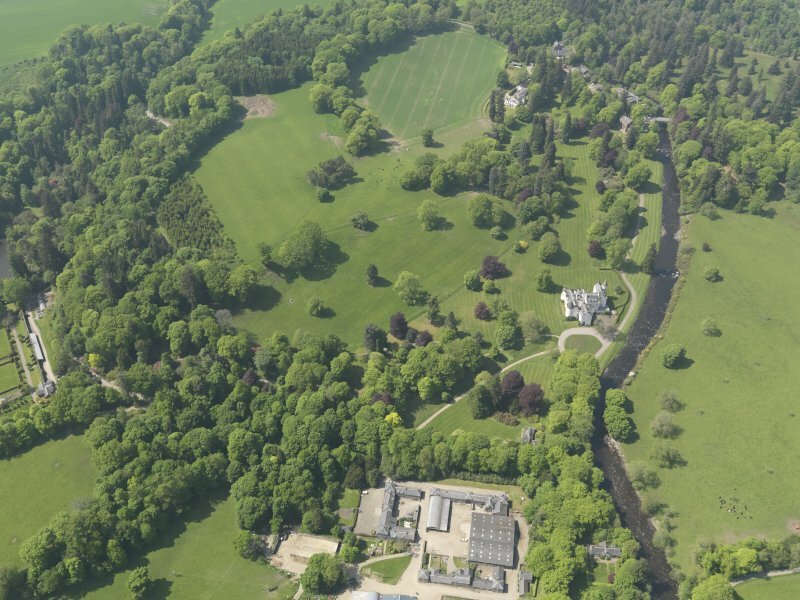 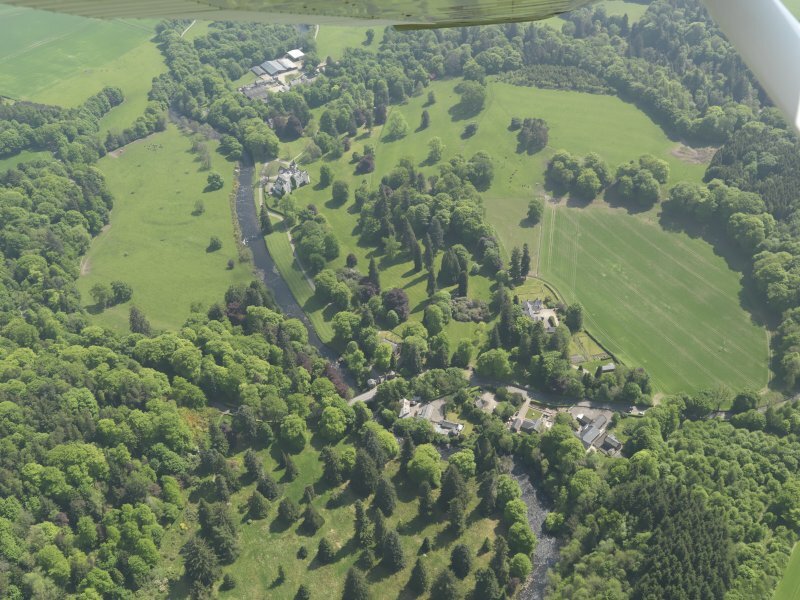 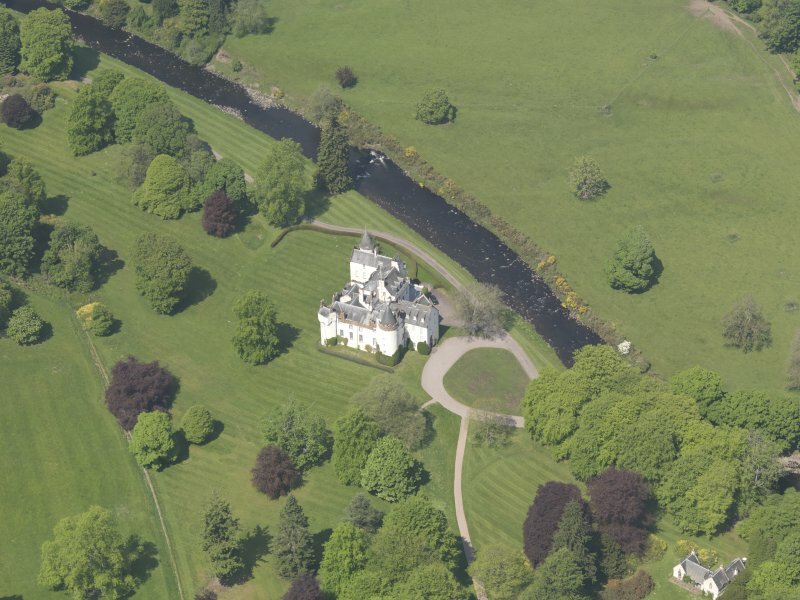 Oblique aerial view of Cortachy Castle, taken from the WNW. 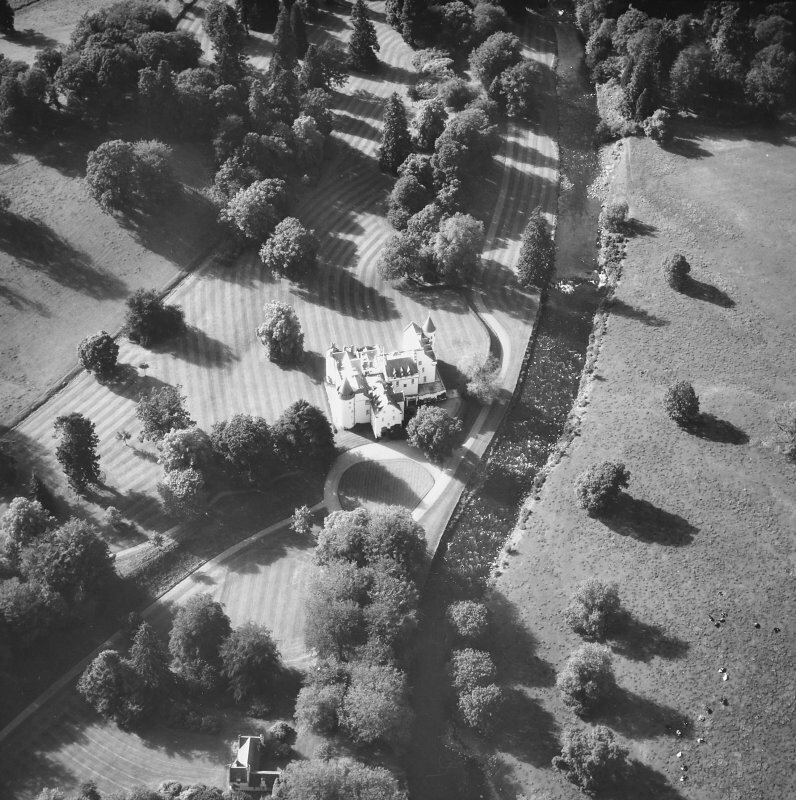 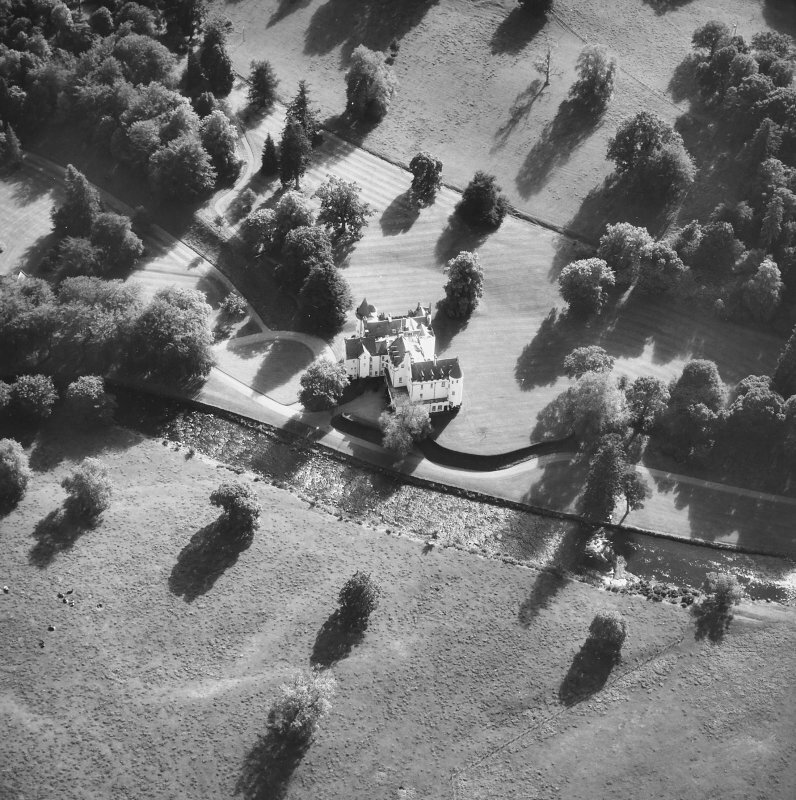 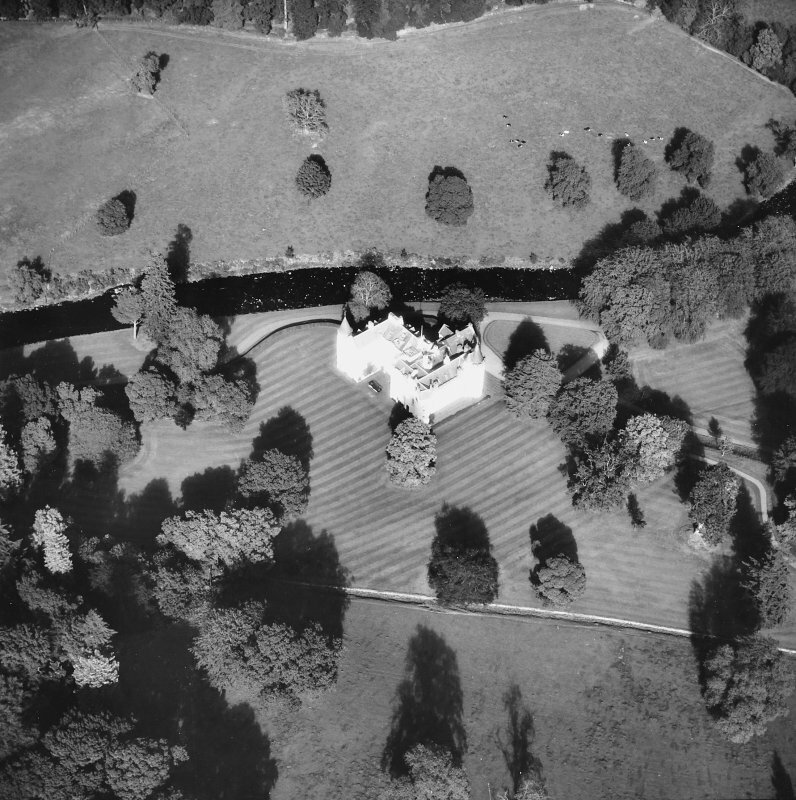 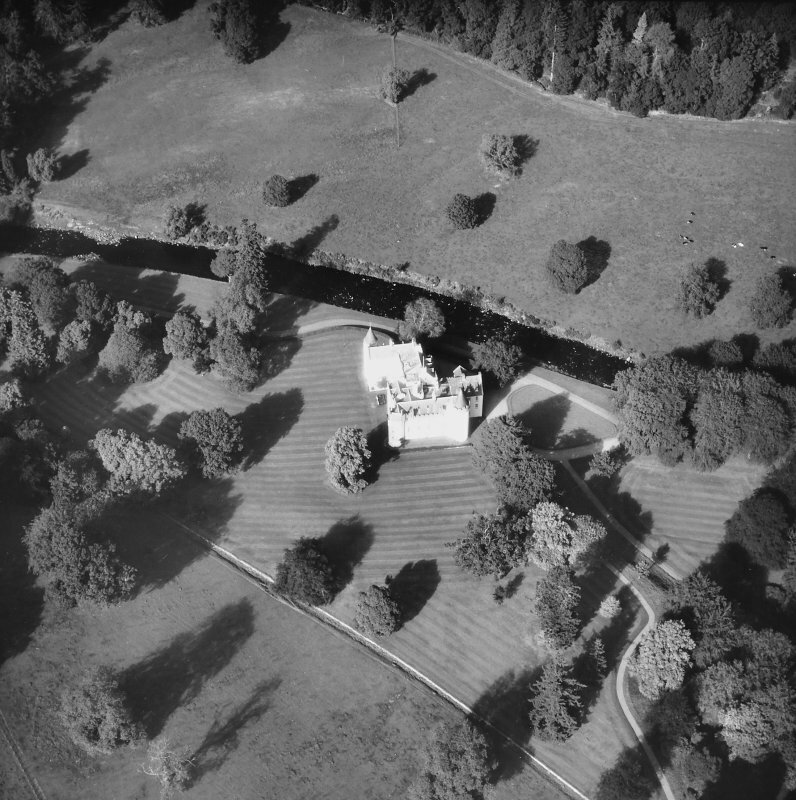 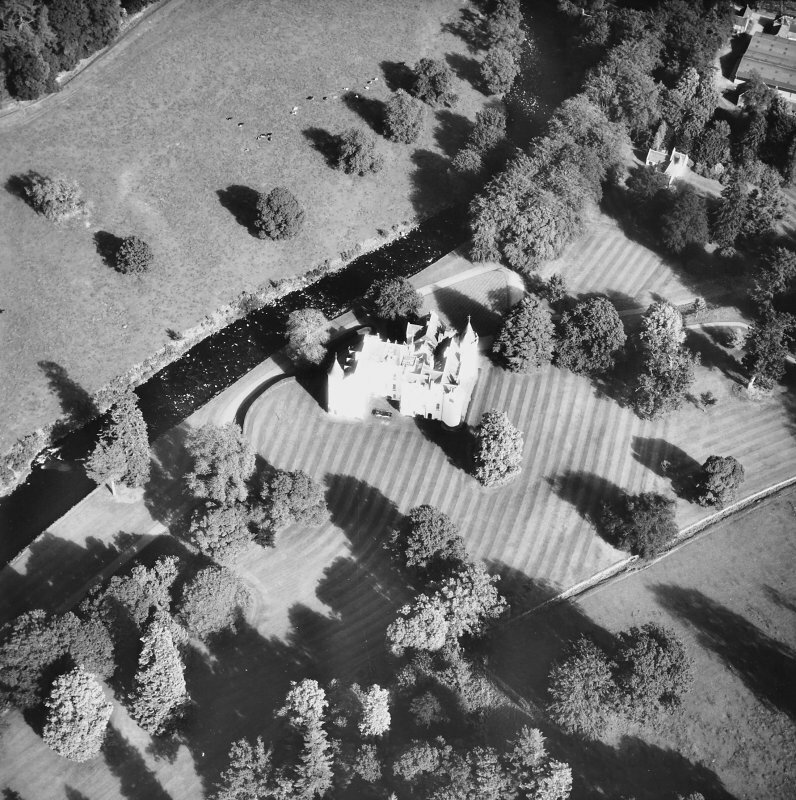 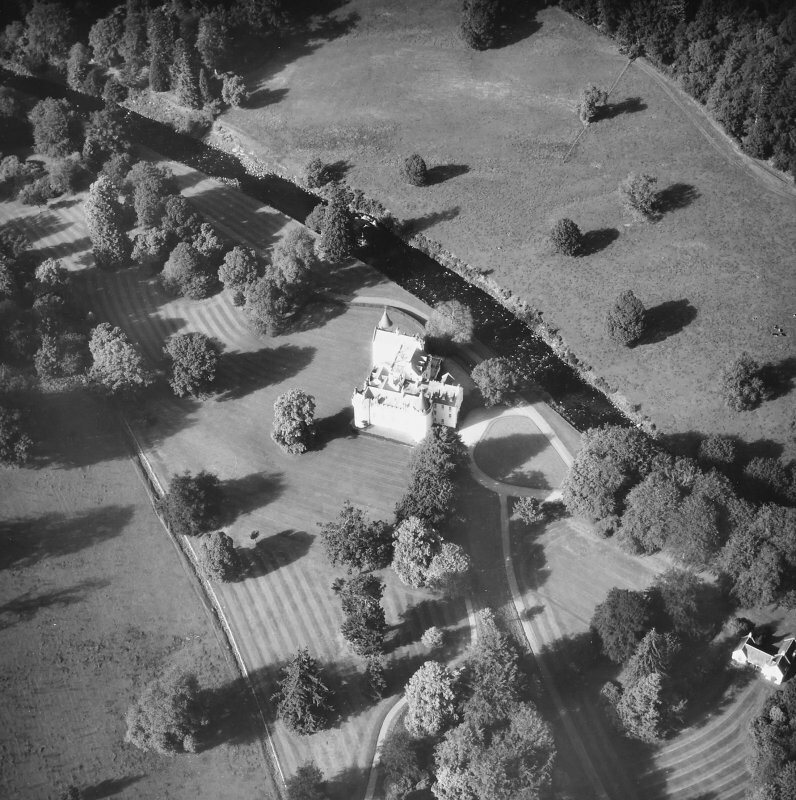 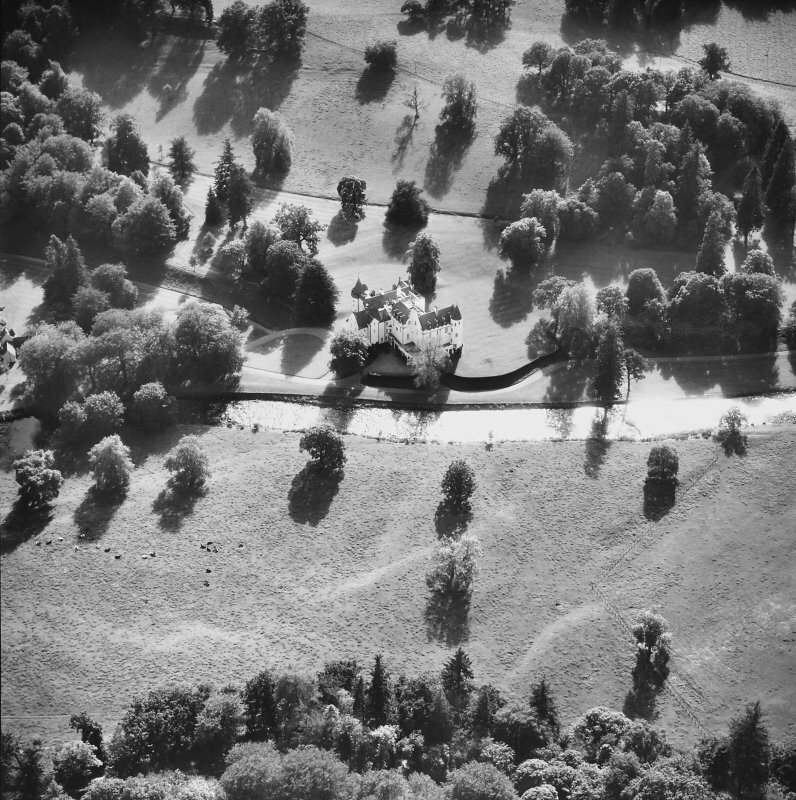 Copy of historic photographic view from W.
Oblique aerial view of Cortachy Castle, taken from the SW. 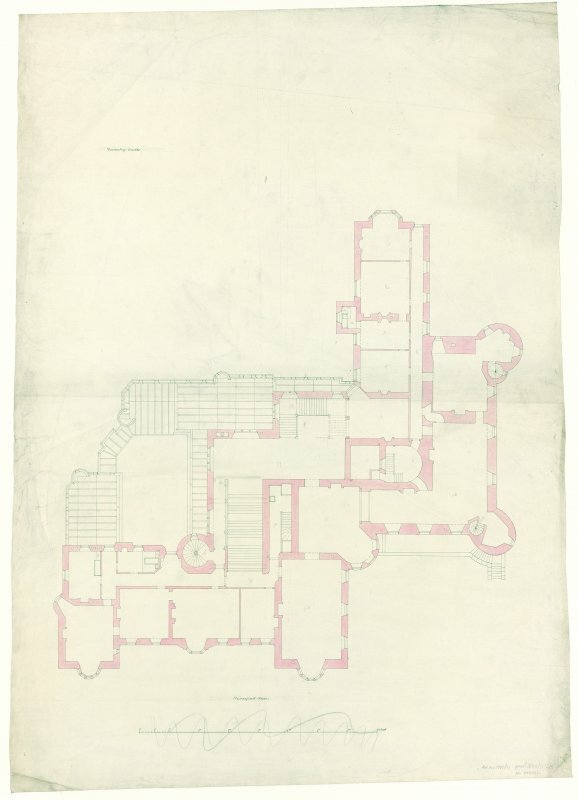 Principal floor plan. 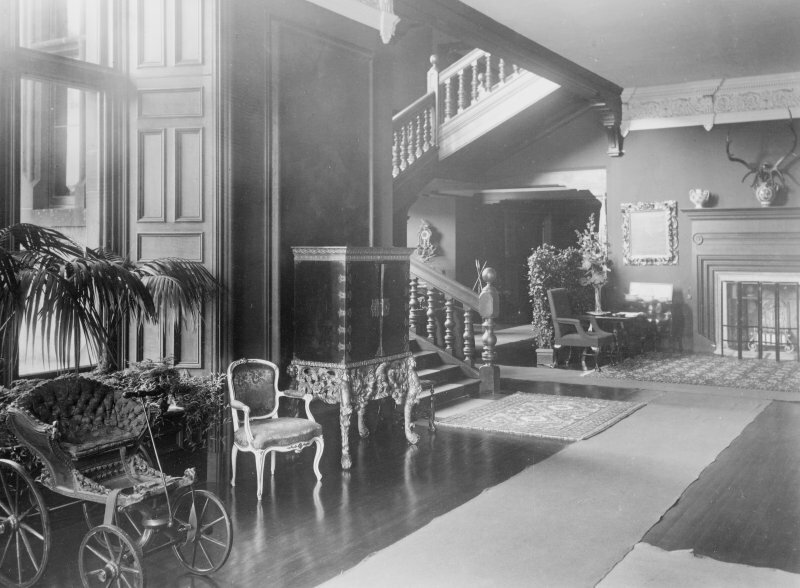 Scanned image of D 37422 CN. 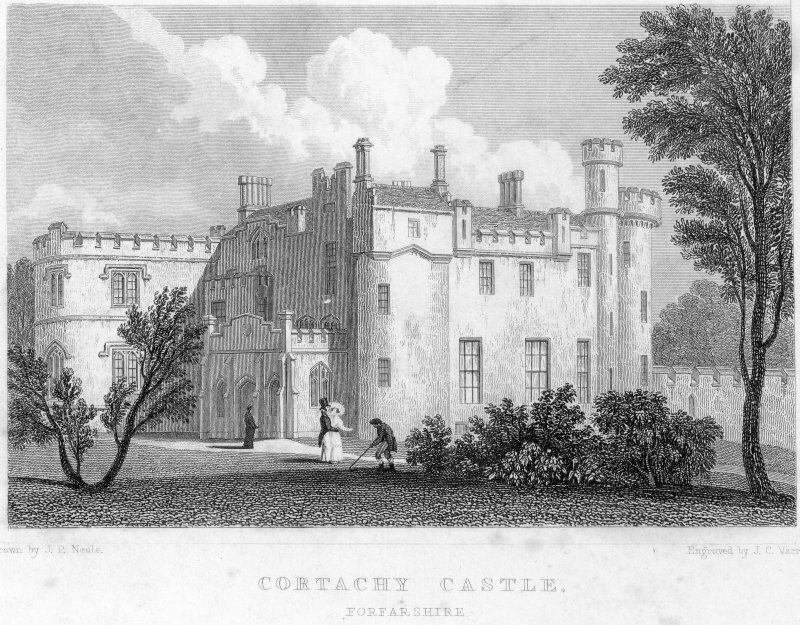 Copy of historic photographic view from E.
For Cortachy House (NO 3947 5961), see NO35NE 77. 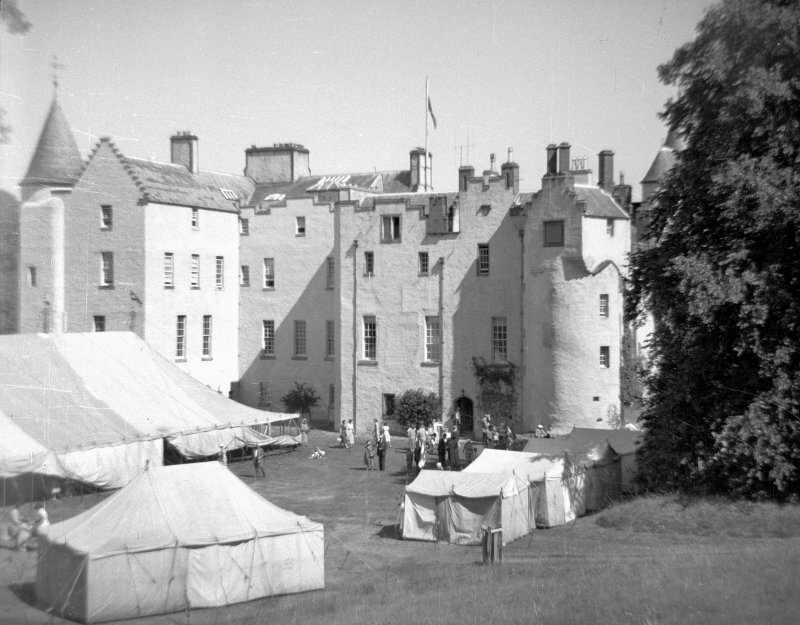 Although Cortachy Castle has been greatly altered and extended down the centuries, it stems from a courtyard-type castle of probable 15th century date, of which three of the circular flanking towers still remain, with portions of the curtain-walling between, which has been raised and incorporated in the later building. 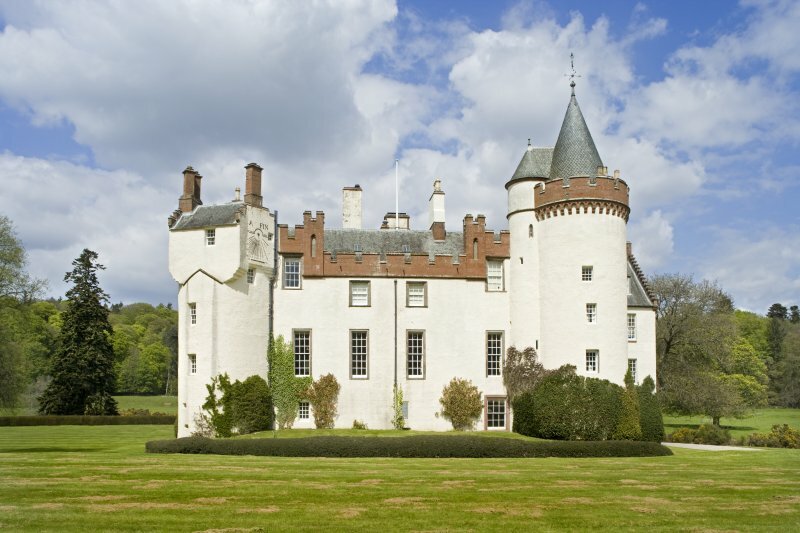 The main tower has presumably been overwhelmed in the extensions to N and E, probably in the 17th century when it came into the possession of the Airlie family. 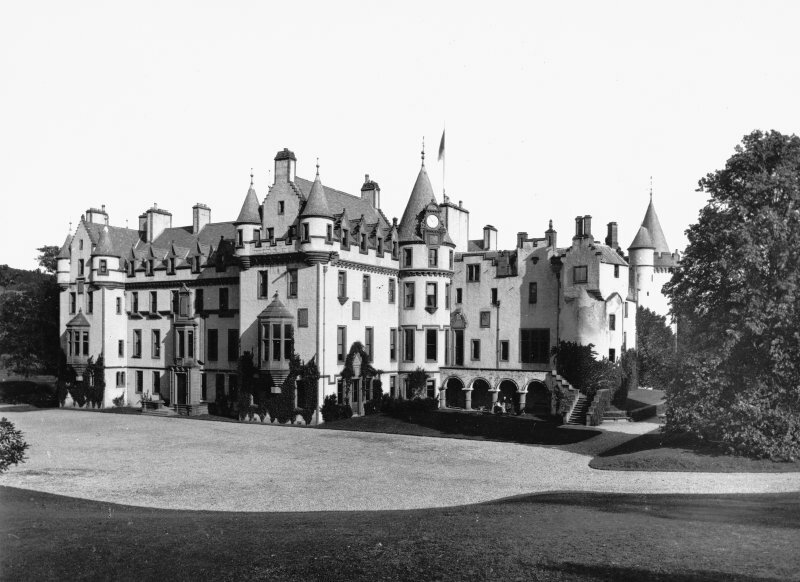 Also, c.1872 extensive alterations were made to the castle and other minor alterations have been made from time to time. 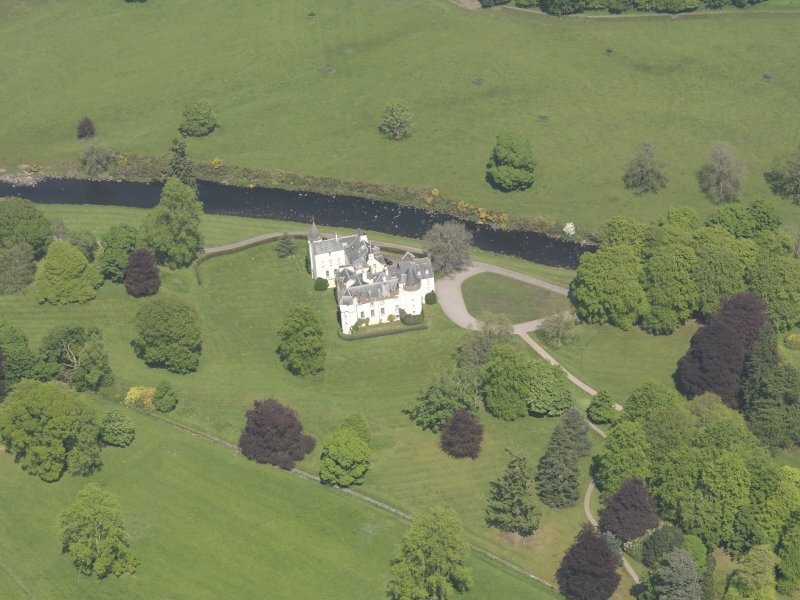 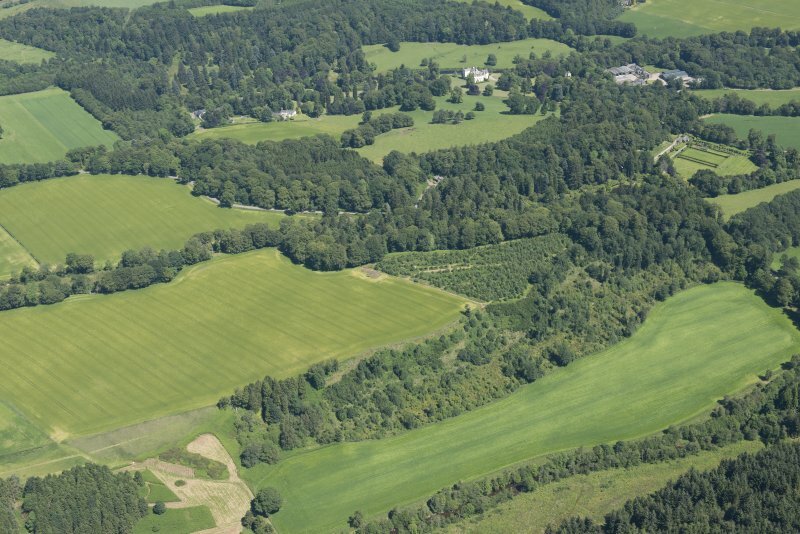 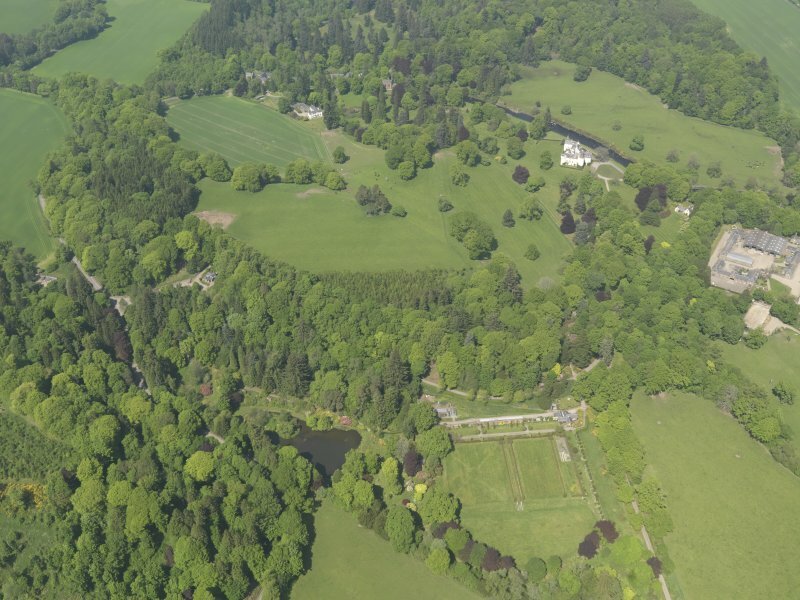 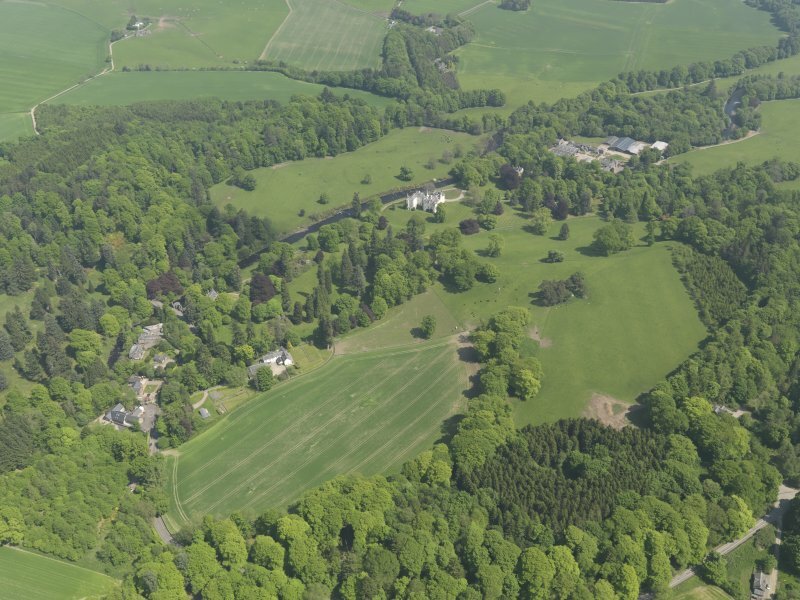 There was a castle here in the 14th century, but no trace remains of it; it then belonged to the Earls of Strathearn. 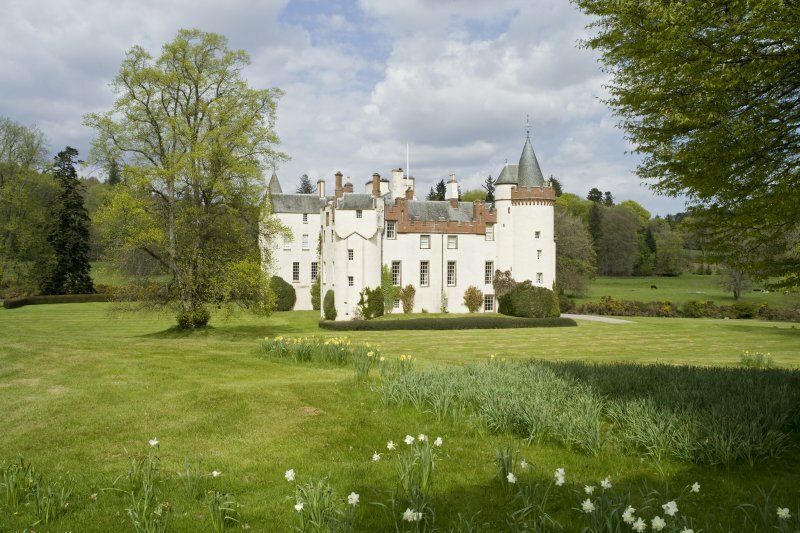 It was granted to the Ogilvies in 1473.They are still in residence. 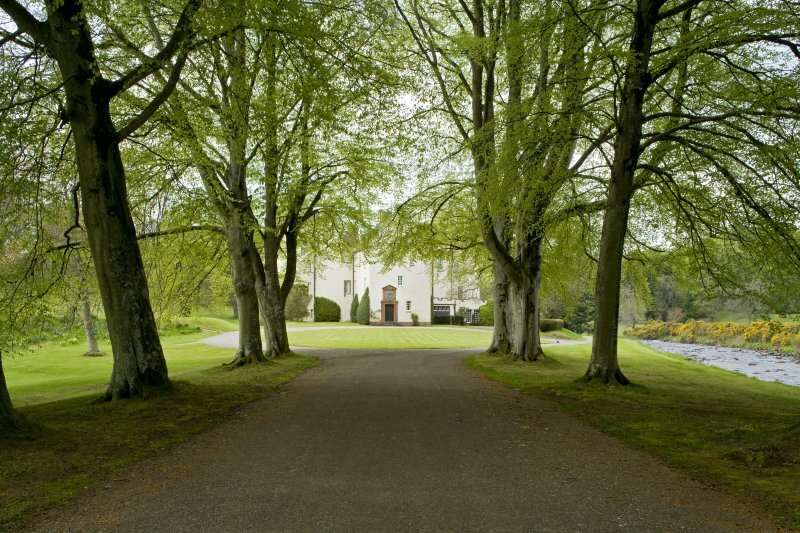 The southern part of the mansion contains the early building with two massive angle towers, but these, with other walls, have been harled and the architectural features modernised, so as to lose much of the original character. 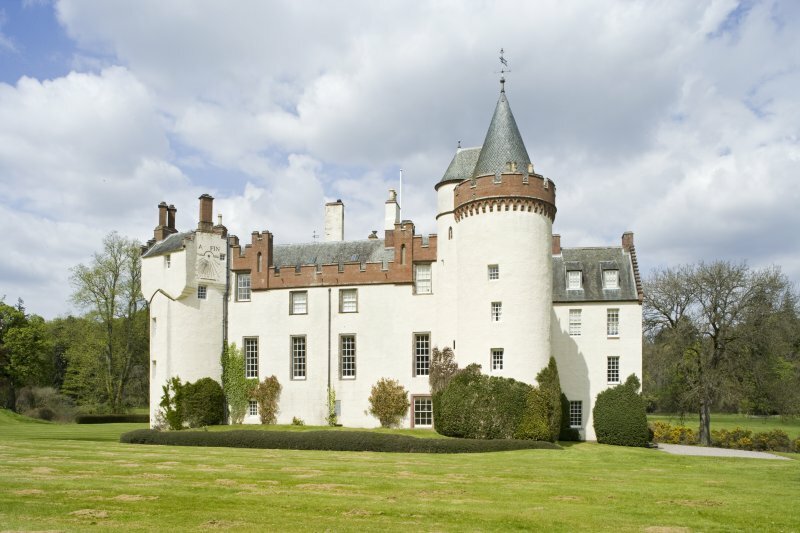 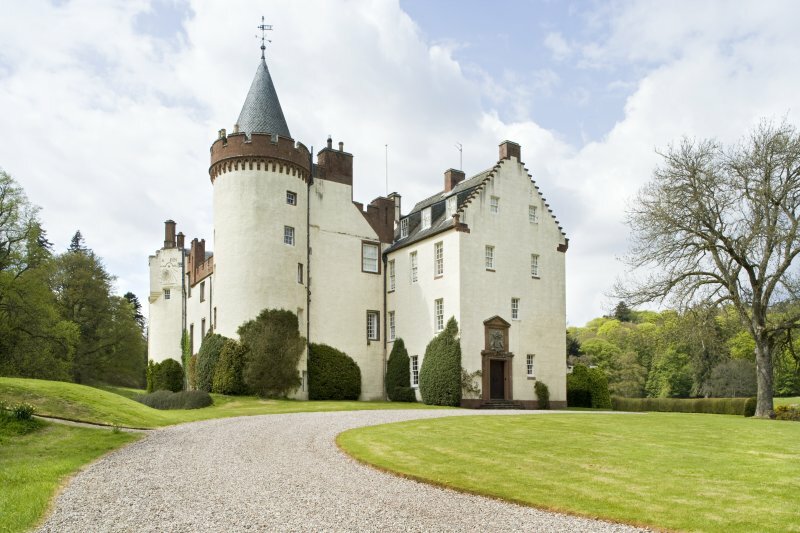 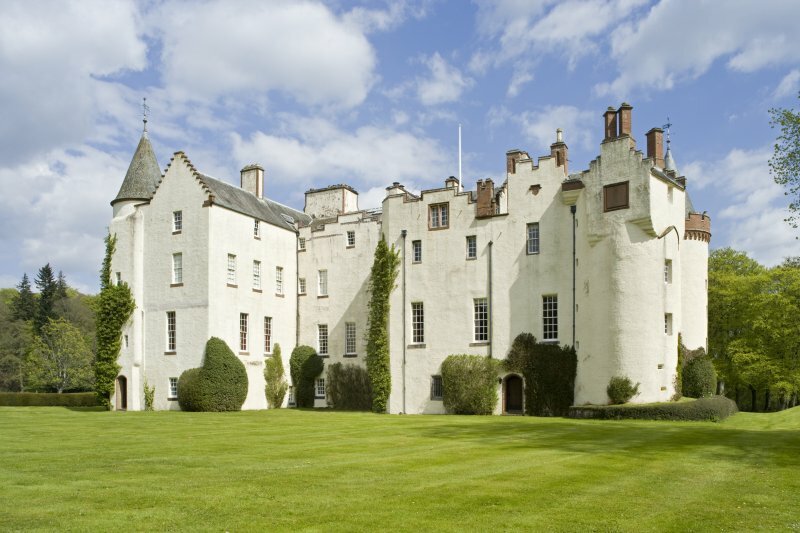 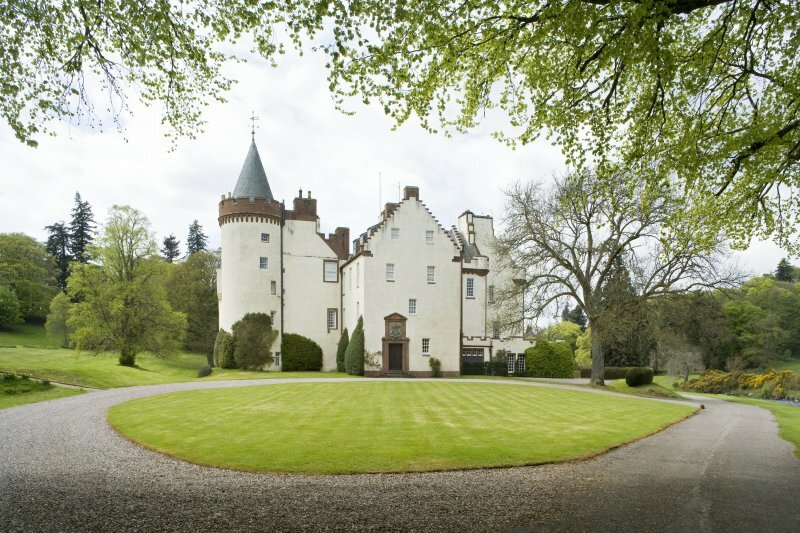 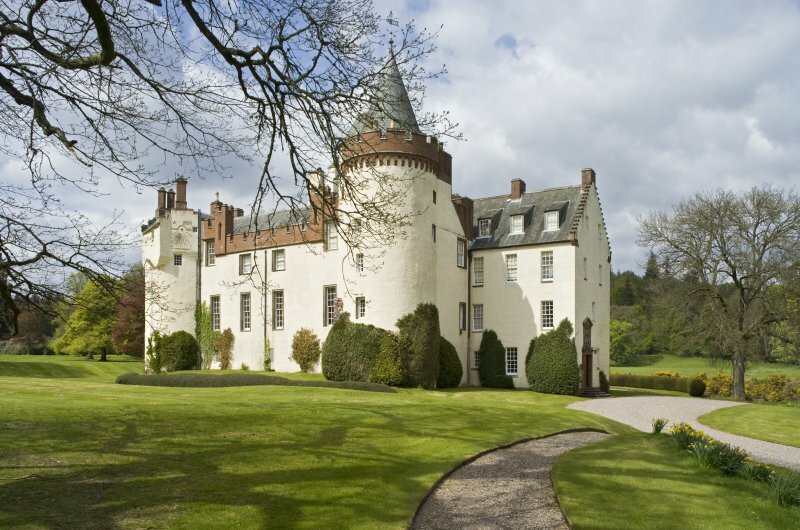 The castle is the residence of the Earl of Airlie. 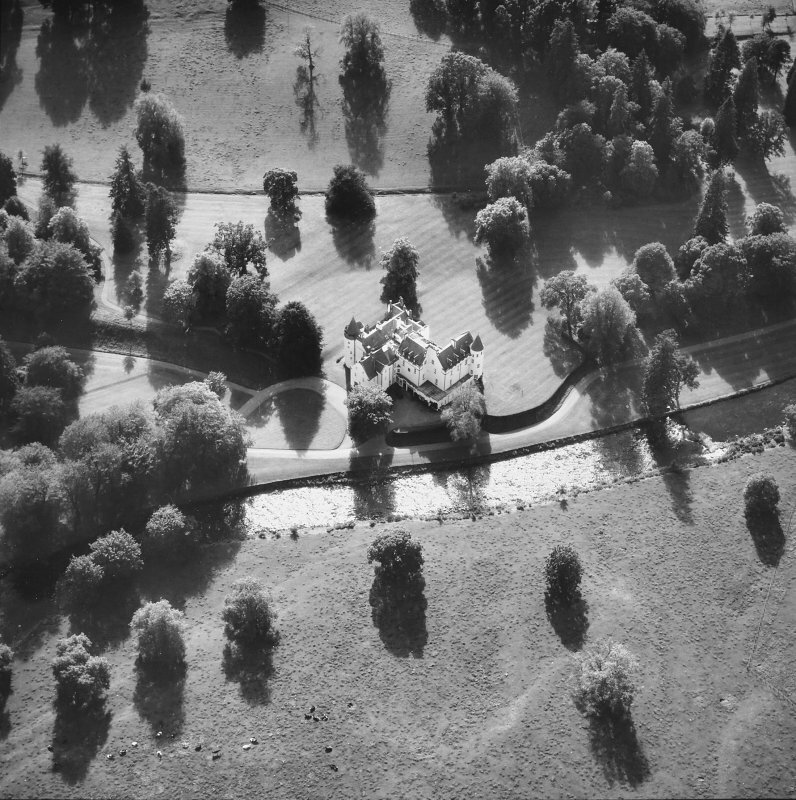 Name confirmed by Estate Office Factor. 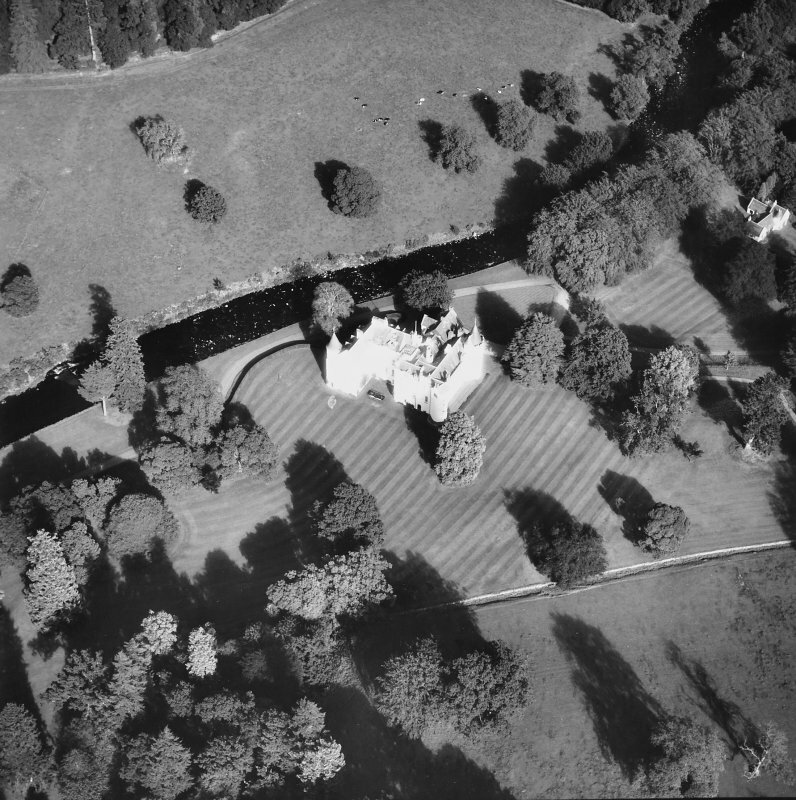 Visited by OS (JLD) 3 September 1958. 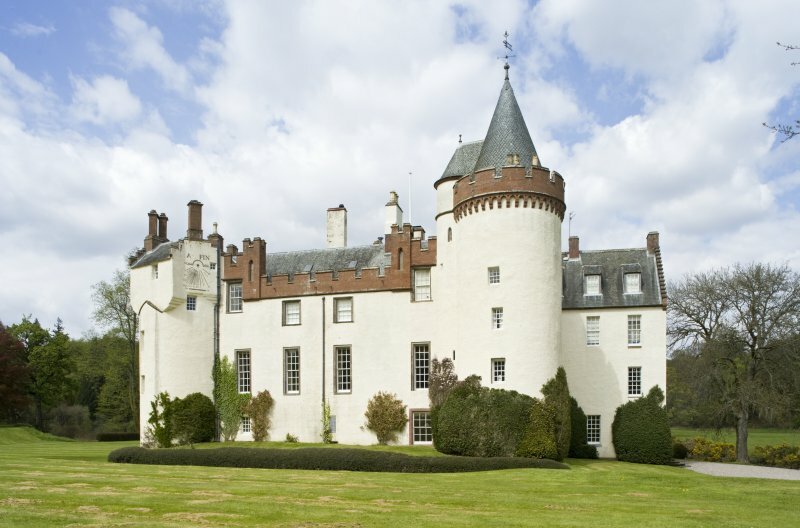 Cortachy Castle is as described by the previous authorities. 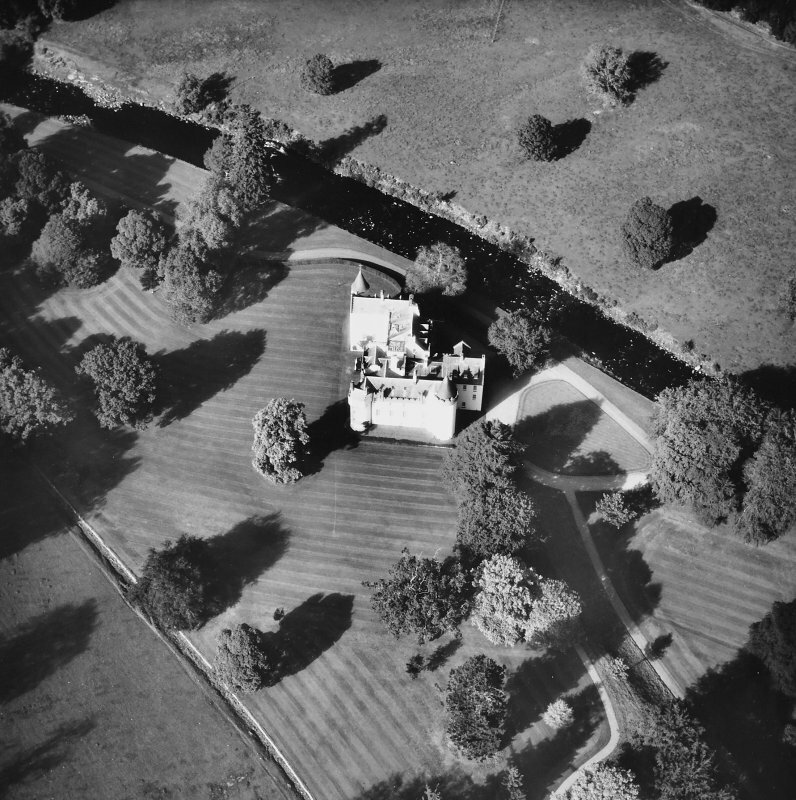 Visited by OS (BS) 10 January 1977. 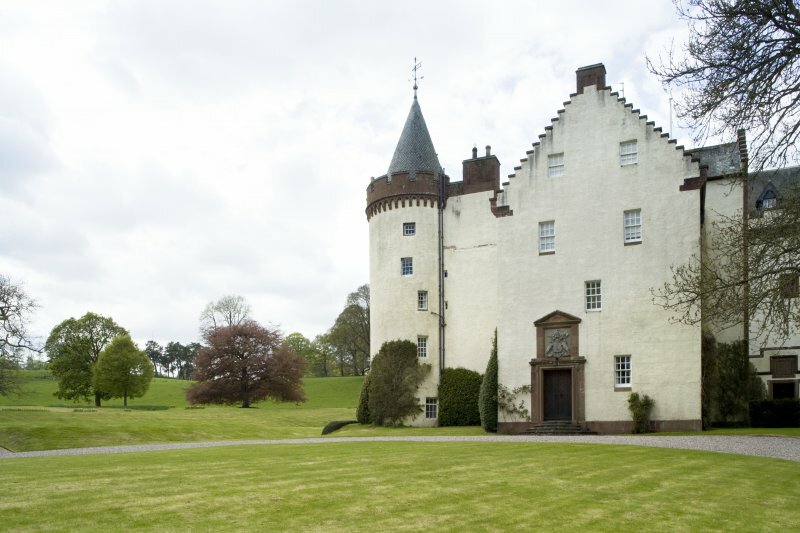 Architects: sixteenth century tower; Richard and Robert Dickson circa 1820 (additions); David Bryce 1870-74 (additions). 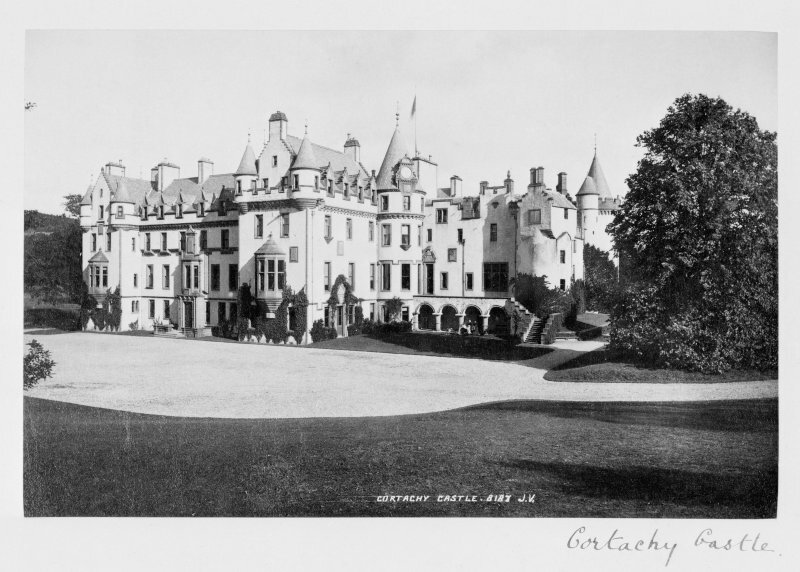 Bryce's work burnt 14 September 1883, reconstructed without tower by Kinnear and Peddie, circa 1884-86. 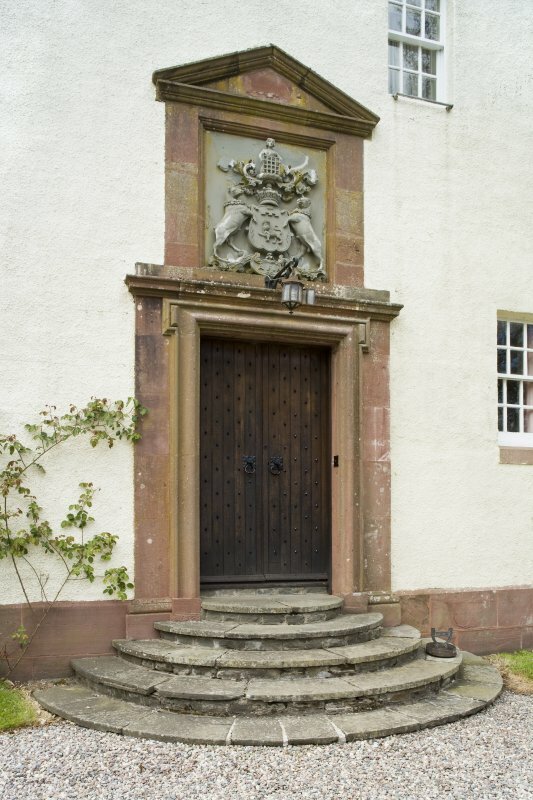 Reginald Fairlie 1933 (additions) (door in garden wall) later rebuilt. 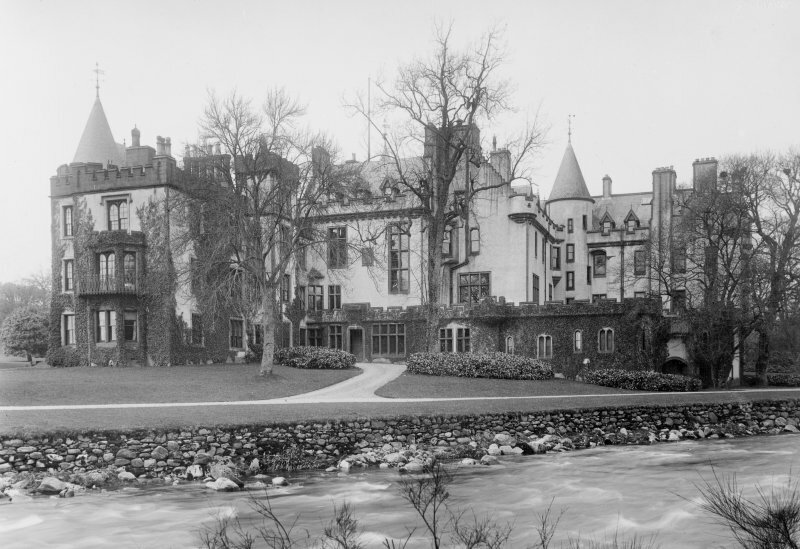 Major reconstruction by Philip Tilden circa 1950, Bryce work demolished, Dickson elevations remodelled. 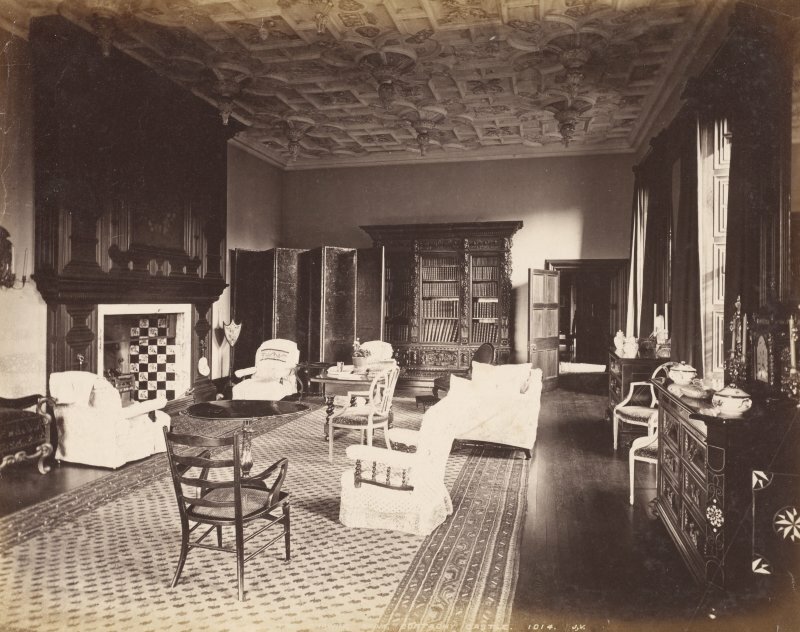 Philip Webb 1868/69 - refurbished Library and probably Holly room and Hawthorn room. 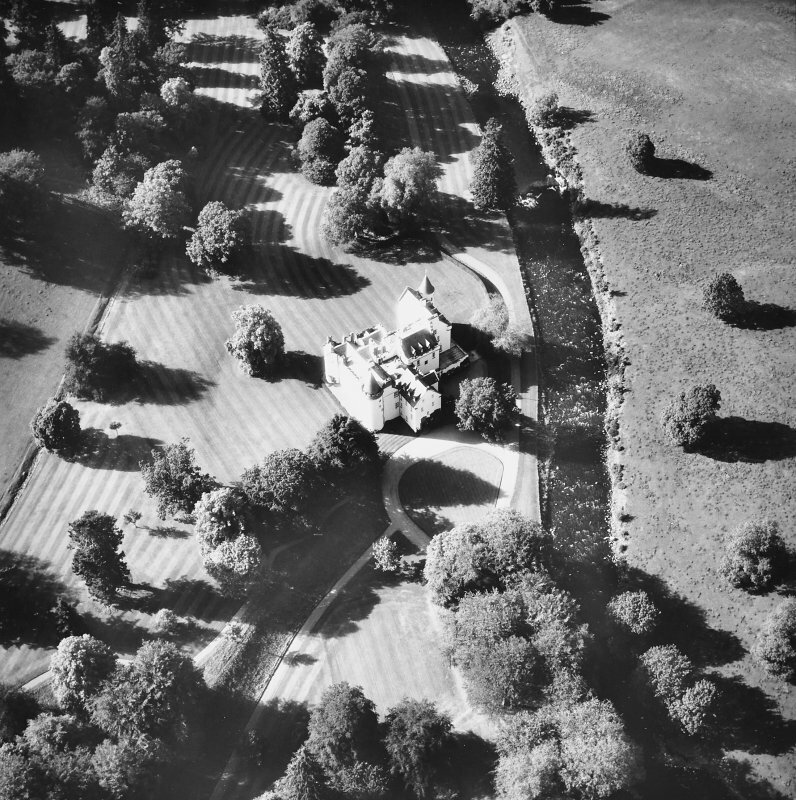 His scheme for additions was not carried out. 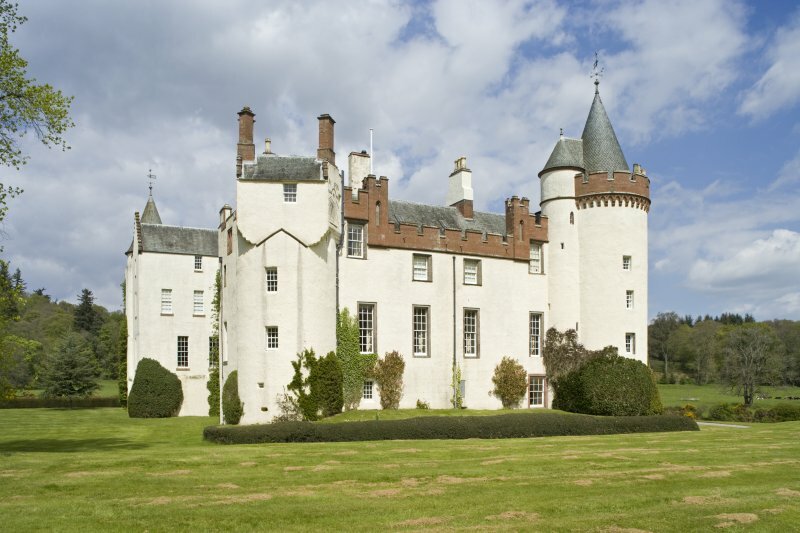 Alterations to the Castle are proposed in a memorandum for Mr McNicoll. 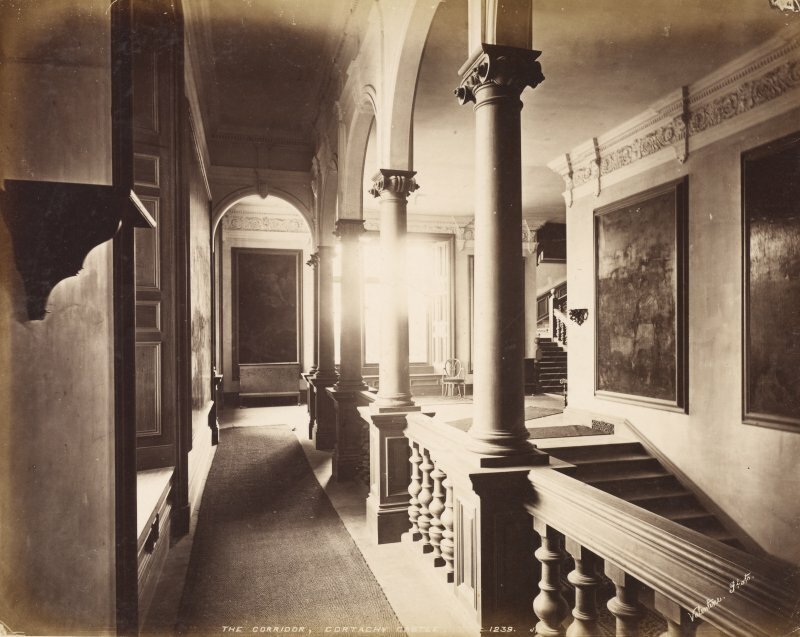 The additions and improvements are to be done under the charge of Mr Dickson. 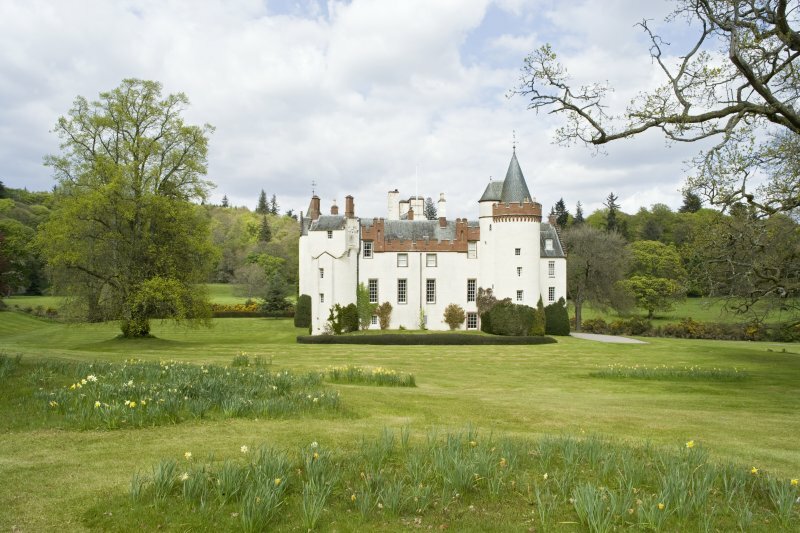 They include a new vestibule and hall inside and turrets and alterations to the South West tower outside. 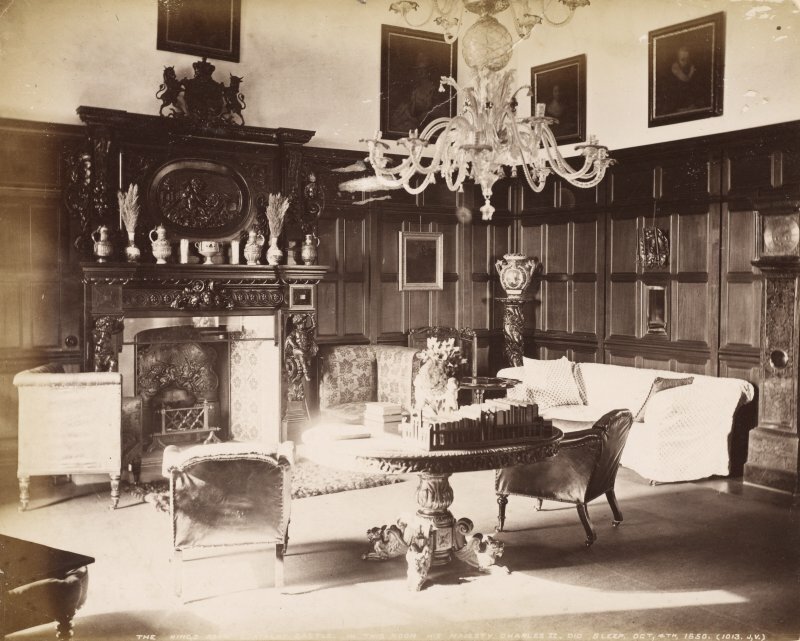 No date (19th century) GD16/27/446. 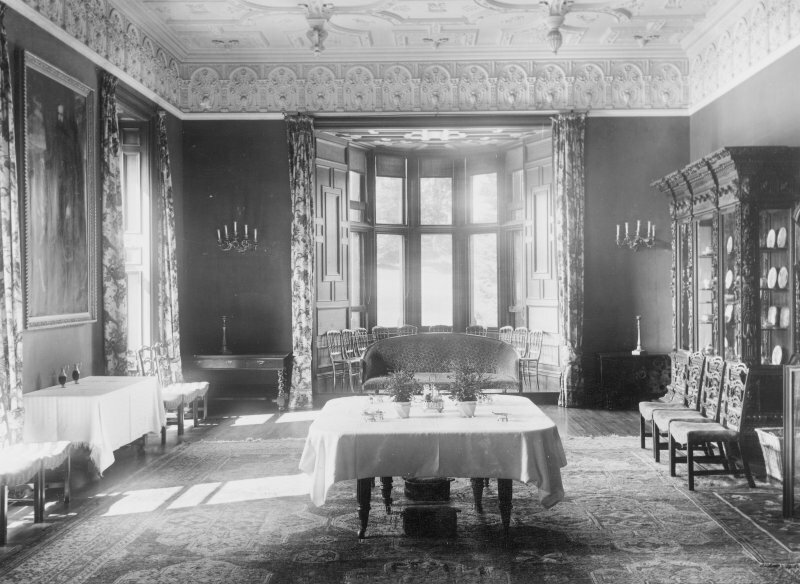 Photographed on behalf of the Buildings of Scotland series.